I have been in Greece several times before, but I never had the chance to visit the Pieria region; or, more precisely, I didn’t remember the times when I had been there on a vacation with my grandparents since I was a little child. Therefore, when I was offered a good price for a week-long stay at an Olympic Beach studio I was glad to accept it. My travel partner and I booked two stays at the same place, one in June and one in August; we were interested in the difference the during the summer season in Olympic Beach. It turns out that Olympic Beach in June and Olympic Beach in August are two different places; the first is almost empty, slow and sleepy; whereas, the second is crowded, loud and awake all night long. 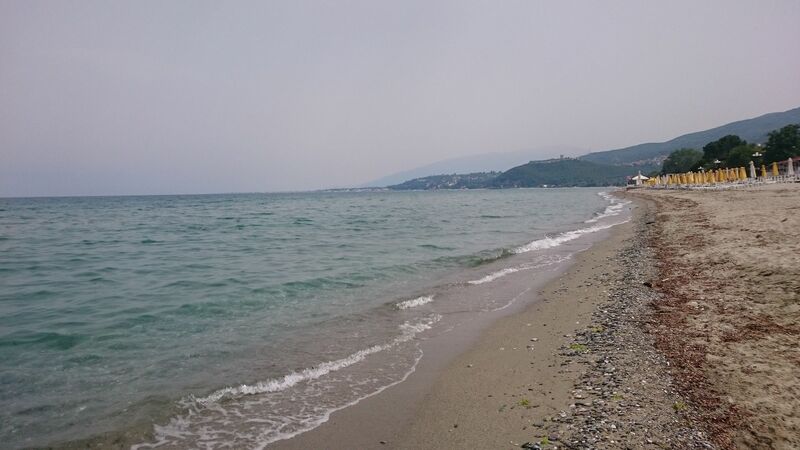 We were, as usual, traveling by car from Skopje and the drive was a pleasant one; however, it took a bit longer to get there than it takes us to get to Chalkidiki; a thing that made me a bit grumpy. Nevertheless, the drive to Olympic Beach was a nice and relaxing one, the roads were generally fine and the only thing that ruined my mood was the substantial number of pay-tolls. Since we were driving around a lot we spent tens of euros on pay-tolls only, plus the gas in Greece is more expensive than the one we have in Macedonia. However, I went there to explore and have a good time, so I was ready to spend some money anyway. Since we went twice to Olympic Beach, we had two completely different experiences in terms of arrival. In June, the streets were empty, easily found parking, and everyone seemed bored and sleepy. The weather was nice, the apartment was even better and therefore we were ready to explore the coastal town. Many of the restaurants weren’t even open yet, while we were able to literary find tens of free sunbeds on the beach. This provided a nice and intimate atmosphere, it was easy to connect with the owners of local shops and bars and just generally talk to people in peace. Obviously, we were shocked to get there two months later and barely find parking, see hundreds of people everywhere, and all shop owners seemed in a hurry. Praying to find a free parking slot became a thing for us in the next seven days, whereas we completely avoided the beach due to the impossible crowds. 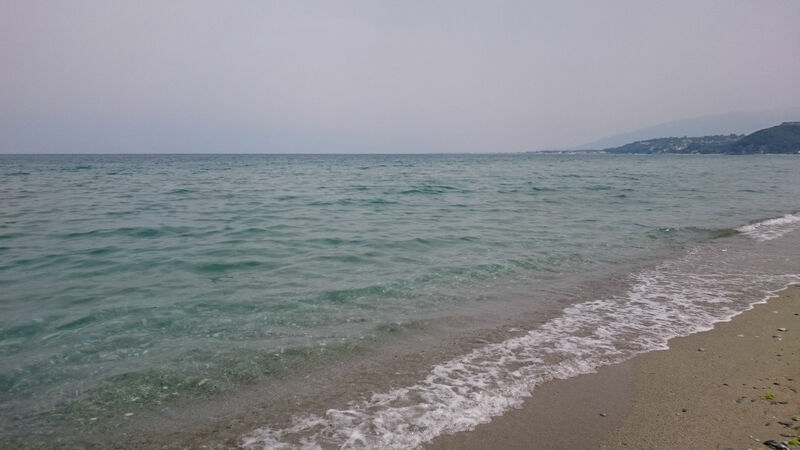 You probably know by now that I love the nature of Sithonia with its forests and crystal-clear sea; thus, Olympic Beach didn’t have the charm I was hoping for. However, I must point out that the endless sandy beaches are very attractive to look at. There are numerous restaurants to choose from. You can find traditional Greek gyro pita, pastry, pizza, barbeque, and seafood. We ate at several places and we were happy with all of them. You should probably walk around and compare prices if you are on a budget since there are some restaurants that are for 15-20% more expensive than the rest. After two weeks in Olympic Beach, here are some things we noticed and would like to point out to my readers. First, the sea isn’t as crystal clear as on the photos. It easily gets muddy because of the sand, plus it’s always windy and as a result, the waves bring algae, other sea plants, and even jellyfish. We dealt with this problem during our August visit, since in June it wasn’t crowded and the water was great for most of the days. However, we saw some amazing sunsets and sunrises in and around Olympic Beach. We were traveling by car and therefore we went exploring other beaches; the one we highly recommend is Litochoro beach in front of the Litochoro Hotel. Even though there are some small rocks at the beginning of the sea, the sea area is mostly sandy and the water was amazing. Plus, we could use the sunbeds and the umbrellas for free if we bought drinks from the beach bar, which we were happy to do. Also, at the time of our visit, the prices were quite reasonable with a frappe and soft drinks being 3 EUR. In comparison, during the 2017 vacation in Pallini Beach Hotel, we had to pay 7.5 EUR only for two sunbeds and an umbrella. Also, sometimes when it’s windy and muddy at Olympic Beach, you can check out the beaches of the nearby towns; for example, we once got lucky in Neoi Poroi. If you get stuck in Olympic Beach during high season, I would also suggest going to the beach early in the morning (really early) or late in the evening (after 6 PM). Early in the morning, the water is usually nice and clear, plus it’s not too crowded. Same goes for late evening when families with kids usually leave to prepare for dinner. Also, if you want to spend some extra money, it’s smart to explore the area since there are lots of interesting things to be discovered. Below are some suggestions. This museum is in Leptokarya and is the perfect adventure for those that want to spend a couple of fun and educative hours. There is a nice collection to be seen alongside signs in Greek and English; thus, it may not be appropriate for those that don’t know English. However, since this paragraph is in English, I don’t think it would be helpful for those that don’t speak English. This gorgeous Orthodox church is located in Paralia; besides its amazing architecture, it is famous for being only 20 meters away from the beach too. Often, tourists are given the unique possibility to experience Orthodox weddings by taking part in it, which I believe is a nice experience to have. All in all, Olympic Beach isn’t a place for everyone. Trendsetters and party animals will surely be utterly bored in this little town. However, it is especially charming to people that enjoy relaxing walks, nice food, and relaxing vacations. It can be fun to explorers as well since it offers several interesting monuments nearby. Personally speaking, I enjoyed the first visit a bit more because it wasn’t crowded and I felt as I had the place for myself. However, during high season there are more shops and restaurants as well as joyful atmosphere. The locals were nice, welcoming and friendly; the prices were reasonable, plus our accommodation was great. Thus, when all the pros and cons were compared, I can say that I was both happy and sad to leave the place. It was nice to go home and start planning another, possibly more luxurious, holiday. On the other hand, it was nostalgic to leave Olympic Beach, a destination where I made some friends, ate delicious food and had many great moments.